Merry Texmas, Ya'll! 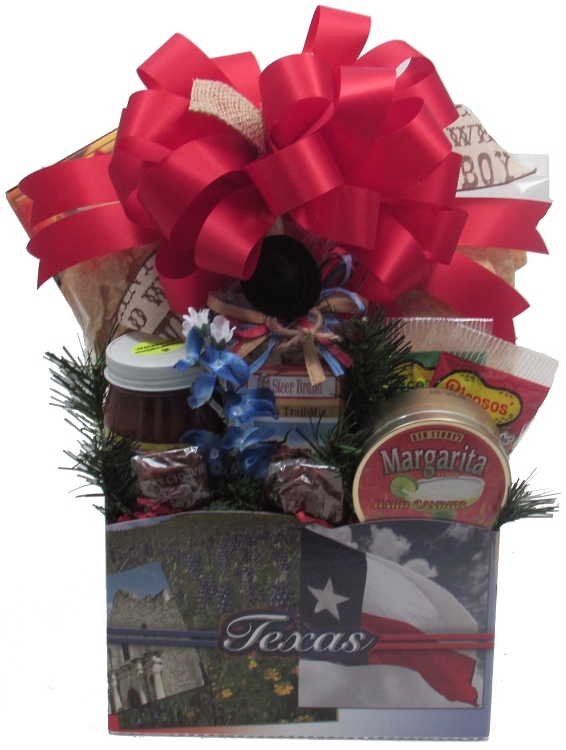 Texas goodies nestled in silk evergreens to be enjoyed by all! Beautiful photos of Texas hot spots cover this design. It's like taking a trip through Texas! Wrapped in crisp clear cellophane and topped off with a Handmade Bow. Includes a Texas silk bluebonnet and a Handwritten Greeting Card. Beautiful photos of Texas hot spots and it is filled with goodies from Texas! Great for every occasion and since the container flattens, it works well for easy travel or to save as a keepsake. Filled full with two bags of restaurant style Lightly Salted Tortilla Chips, Texas Salsa (our caviar! ), Texas Trail Snack Mix, Salted Peanuts, Hot Chile Peanuts, two Chewy Pralines, and a gold tin of Margarita Hard Candies (no alcohol), and a really great box of Chocolate filled Wafer Cookies all nestled in silk evergreens. We even include a cute felt cowboy hat, lariat rope, silk bluebonnet, and a handwritten greeting card! Cookies, Tortilla Chips, Salsa, and Margarita Candies are from Dallas area companies. Texas Trail Snack Mix, Peanuts, Pralines are from Texas companies. Wrapped in crisp clear cellophane and topped off with a handmade bow for local DFW metroplex hand delivery - approx. 19" H x 10" L x 8" W. For shipments, we design lower in the container, shrink-wrap, and top it off with our signature burlap and Texas ribbon. NOTE: The manufacturer made this container in two (2) sizes. This is the largest size. New Photo coming soon.